Savannah has a nice river walk area with lots of nice-looking restaurants. 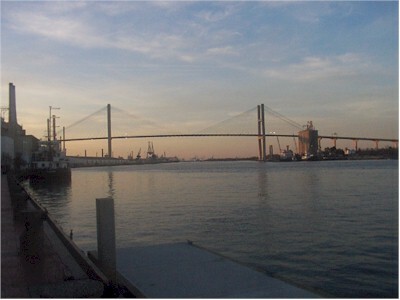 This is the bridge to South Carolina. We didn't go over it, but it looks like the SC side has a few casinos. Today is Susan's birthday. Unfortunately, I couldn't be with her and the kids. Matt and Scott had a celebration for her anyway.